Edwardian glass rouge pot with sterling silver cover. Made by William Neale in Chester in 1901. Pot clear and round with straight and faceted sides. 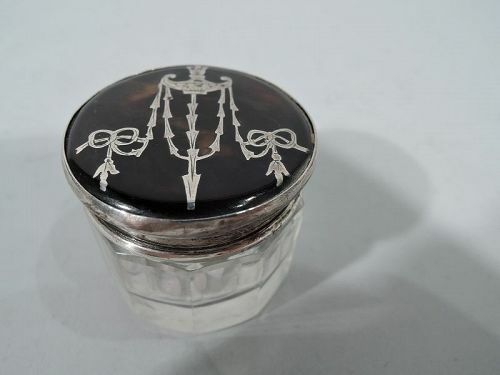 Cover flat with inlaid ribbon-bedecked oil lamp, and sterling silver sides. Fully marked. Very good condition. 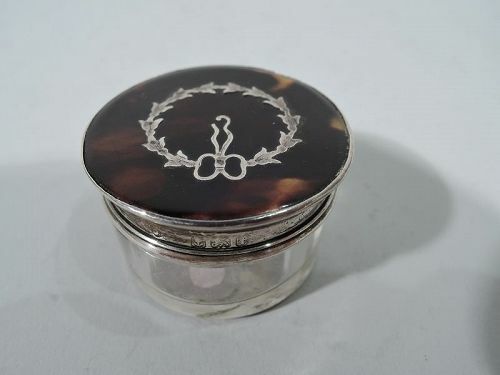 George V glass rouge pot with sterling silver cover. Made in Birmingham in 1918. Pot clear and round with straight sides. Cover flat with inlaid ribbon-tied wreath, and sterling silver sides. Fully marked (maker’s mark indistinct). Very good condition.